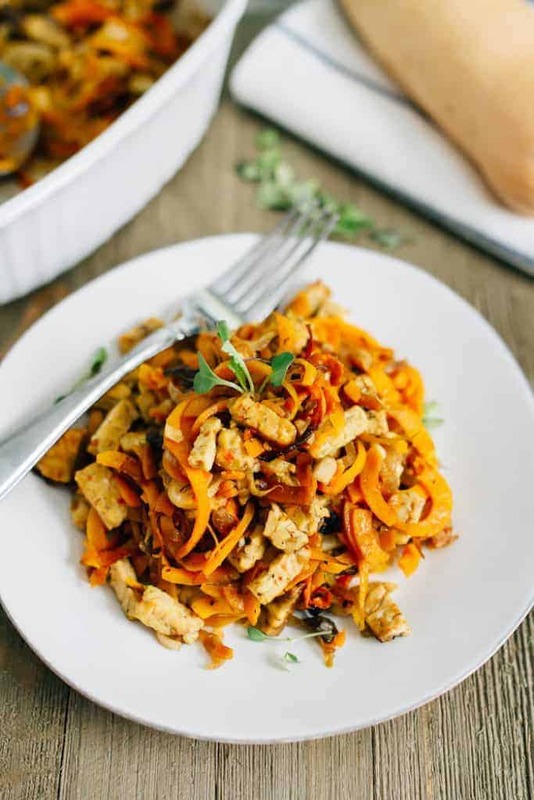 Turn spiralized butternut squash into an easy weeknight meal with this one-pan tempeh butternut squash noodle bake. It’s loaded with flavor, packed with plant-based protein, vegan and gluten-free. Hi!!!! I’m Brittany, a health coach, personal trainer and the blogger behind Eating Bird Food where I share recipes, workouts, wellness articles, travel adventures and more. Food and nutrition are my passion so obviously Alexis and I are two peas in a pod. We bonded over medjool dates on a blog trip to Arizona with Natural Delights (check out Alexis’ post here) and we’ve been buds ever since. I’m stoked to be here sharing a recipe with you guys while she’s off enjoying Italy, but I’m not going to lie, I am also a tiny bit jealous. Guess I’ll just have to eat gelato and drink Chianti while watching her Insta stories so I can pretend I’m there too. Who wants to join me?!? 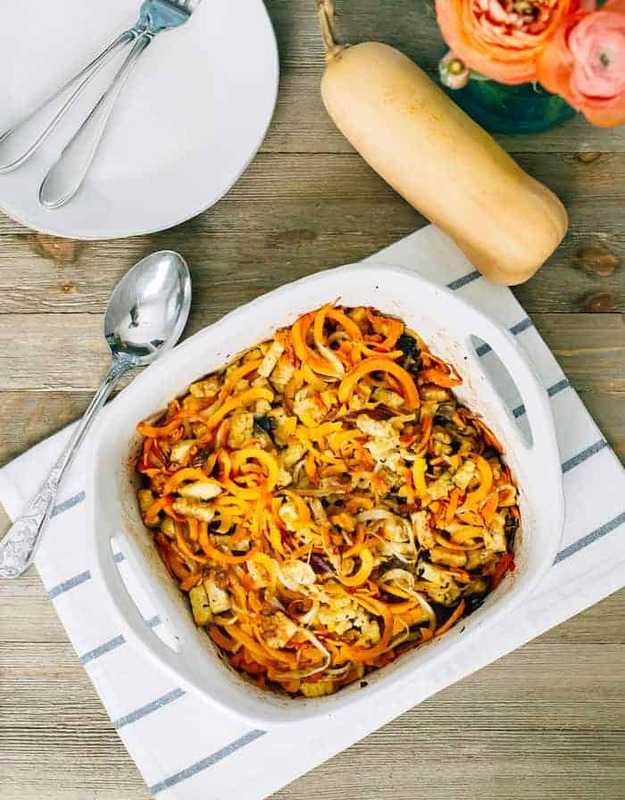 I was going to share a salad recipe with you because I’m all about encouraging everyone I meet to eat one large salad a day, however I know Alexis loves tempeh (obsessed with this Hearty Vegan Stuffing) and anything involving baked noodles (like her famous spaghetti bake) so I went with this tempeh butternut squash noodle bake instead. That said, you should still check out my Seven Slimming Salads ebook. It’s packed full of delicious salad recipes. 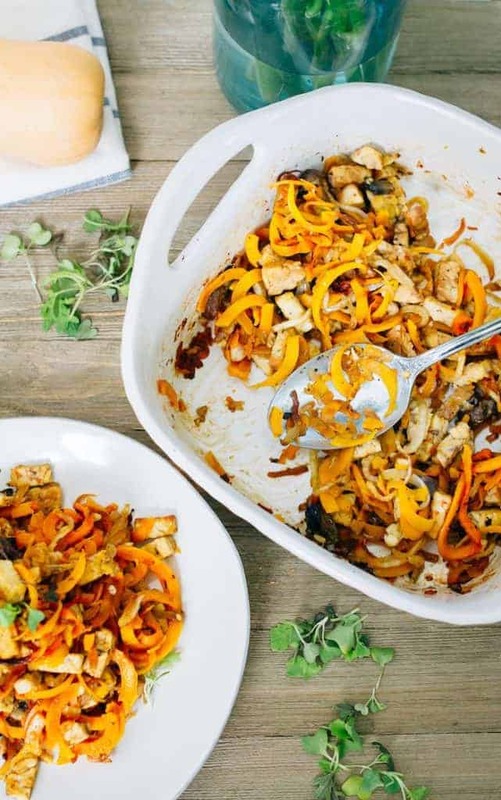 This simple dinner recipe is a spin off of my One Pan Tempeh and Butternut Squash Bake. I used the same ingredients and sauce, but turned the butternut squash into noodles with the spiralizer. I’d actually never spiralized a butternut before until making this recipe, but it worked great! I just used the long neck of the squash for the noodles and saved the bottom area with the seeds for another recipe. If you’re new to tempeh, don’t worry! It’s pretty easy to find at most grocery stores these days. Just look in the refrigerated section, near the tofu. The flavor is a little nutty, but the tempeh will take on whatever flavor you season it with. Plus It’s loaded with protein, cooks quickly and it’s fermented so you’re getting all those added health benefits. This blog post I wrote about the health benefits of fermented foods explains more. 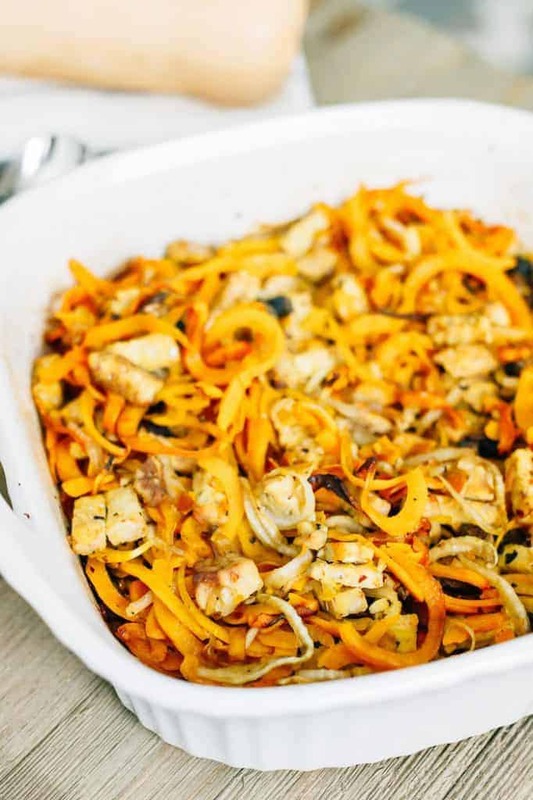 So yeah, this tempeh butternut squash noodle bake is not only good for you, it’s also delicious. It’s a win, win. And it’s soooo easy. Just toss all of the ingredients together with the ginger garlic sauce, bake and you’re ready to eat! I hope you like it. Whisk tamari, coconut oil, apple cider vinegar, ginger and garlic in a small bowl. Add tempeh, butternut squash noodles, onion, and mushrooms into a large bowl. Pour sauce over the tempeh mixture and toss to coat. Sprinkle on sea salt, ground pepper and crushed red pepper flakes to taste. Pour mixture into a square baking dish. Cover with aluminum foil and bake for 35 minutes. Pull baking dish out, remove and discard the aluminum foil, stir and place back in the oven for another 15-20 minutes or until butternut squash is cooked to your liking. If you’re like me and enjoy your tempeh a little crispy, you can turn your oven on the broil for the last 2-3 minutes. Remove from baking dish and serve with sriracha or chili sauce. Thanks again to Alexis for having me! If you’re interested in connecting, you can find me over on Eating Bird Food or on Instagram, Facebook, Pinterest and Snapchat. im loving her snaps from Italy!!! sounds like a perfect Fall dinner.